BMH Kamunting in the Far East was situated in the bottom of the jungle hills and was set up to care for those injured during the guerrilla was with Chinese insurgents. The most famous Matron of British Military Hospital Kamunting, Taiping, Malaysia, was Sister Aggie McGeary RRC MBE QAIMNS and QARANC more of whom is written about on the Royal Red Cross Medal page. During her time in the 1950s at BMH Kamunting she was famed for holding mess parties for her fellow QA's, whom she affectionately called "her girls", where she would match them with young officers from nearby units. Several marriages took place as a result! She was also noted for her determination in getting the best of care for patients and her compassionate nature. 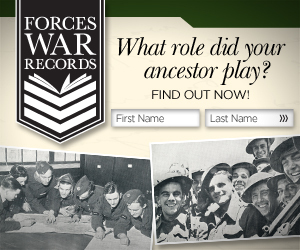 RAMC Commanding Officers were Lieutenant Colonel Phelan in 1950 and Lt Col Clarke in 1951. Several photos of the wards and staff of British Military Hospital Kamunting can be seen on the BMH Singapore page. 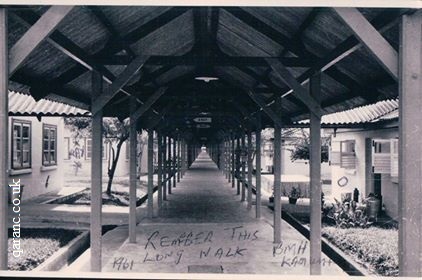 Pictured is what was known as the long walk at BMH Kamunting Taiping Malaya taken around 1960 to 62 by “Taffy” John Wynne RAMC who’d love to hear from anyone serving then. Please contact me if you can help.